AMD's Ryzen mobile processors follow in the wake of the desktop-class processors (CPUs), with commercial-grade Ryzen Pro mobile processors following. That trend continues into Ryzen's second generation, as AMD has officially unveiled its 2nd Gen Ryzen Pro mobile processors in a press release. 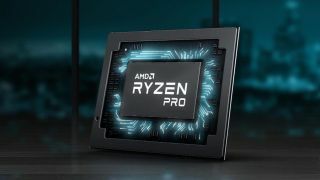 The new Ryzen Pro mobile processors come more than a year after the launch of AMD's first Ryzen Pro mobile CPUs, and just about a year after the launch of desktop-class 2nd Gen Ryzen processors. AMD has also included a new, Zen-based Athlon Pro CPU in the launch. The 2nd Gen Ryzen Pro mobile CPUs are still targeted at the laptops of business users, though, with performance, efficiency and security features to fit commercial needs. However, AMD says the new processors are made for "premium professional notebooks to everyday productivity notebooks," potentially expanding their reach to the growing 'prosumer' segment. The 2nd Gen Ryzen Pro processors are all built on 12nm architecture, which is likely to help with efficiency, and a low 15W TDP on all of the new chips make them viable options for thin and light laptops with low-power cooling solutions. AMD boasts long battery life on the new processors, with up to 12 hours of general office use and 10 hours of video playback. Built-in Vega graphics can accelerate graphical workloads, like video editing and 3D modeling. Meanwhile, a security co-processor is built into the silicon of the processors. The first computers to include the 2nd Gen Ryzen Pro and Athlon Pro processors are expected from HP and Lenovo this quarter, with more OEMs expected this year.